Cherwell delivers IT service management, workforce and business enablement solutions that allow IT to become a true partner to the business. 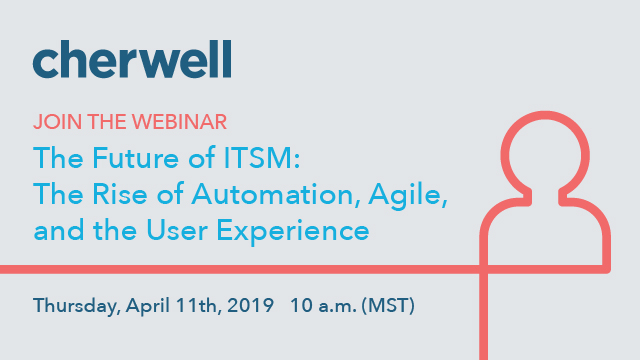 Built on a modern, metadata architecture, the Cherwell platform enables IT teams to rapidly build, configure or merge new ITSM or business functionality—without touching a single line of code or living in fear of the next upgrade. Because of Cherwell’s focus on delivering a solution that is easy to configure, customize, and use, IT organizations extend Cherwell to solve a wide range of IT and business problems. With an unwavering commitment to putting customers first and being easy to do business with, Cherwell enjoys 98%+ customer satisfaction rating. Learn more at www.cherwell.com. "Digital Transformation” is one of the most popular action items IT leaders are tasked with today. The goal is to keep pace with customer demands in order to compete in a constantly changing economy. In order to support evolving technology, ITSM has progressed from reactive to proactive, in some cases utilizing pattern recognition in the form of predictive analytics (Big Data) to bypass the need for human intervention. As IT teams look to create higher velocity and improved speed to market, they are recognizing the need to integrate various specialized domains that traditionally operated as silos. Until the recent release of ITIL 4, best practice frameworks covering ITSM, Software Development, Project Management, and others have not helped in this regard, as they each focused on their own area of specialization, with little to no direction on how they integrate. The newly-released ITIL update, ITIL 4, does away with the ITIL v3 service lifecycle that was based around the five elements of service strategy, design, transition, and operation, plus continual service improvement (CSI). The ITIL 4 service value chain offers a new approach to managing services within IT that transcends traditional silos and drives significant benefits to the business. Cloud computing continues to grow at an astounding pace, and as a result, IT teams find themselves getting bogged down with manual cloud administration. Furthermore, many organizations struggle with governance of their hybrid multi-cloud environments, leading to potential downtime, longer time to resolution, and spiraling cloud computing costs. ITIL 4, the latest version of the most widely adopted ITSM framework, has been released! This version integrates DevOps, Agile, and Lean IT principles for a holistic end-to-end systems approach. Pink Elephant, well-known for ITIL training and certification, has played an integral role in ITIL and IT service management over the past 30 years. The ITIL experts from Pink Elephant have been at the forefront of ITIL’s evolution since its inception, and are now playing a significant role in the development of the latest version, ITIL 4. Join George Spalding, EVP, Pink Elephant, 20-year ITIL veteran, who has been working with ITIL 4 since early last fall and who co-authored the ITIL V3 Continual Service Improvement volume, for an inside look at this most recent ITIL release. Industry best practices provide IT service desks a wealth of metrics to adopt, and benchmarking data offers guidance on the KPIs to employ. These have both remained virtually static for the last decade or longer. However, a growing reliance on IT services, a rapidly changing technology landscape, and demands that the service desk shift from a cost center to a value center, is forcing IT leaders to re-think and re-define traditional KPIs and metrics. Those who remain complacent in this respect will almost certainly fail to deliver the outcomes the business demands. Thanks to your organization’s growing reliance on IT services, the importance of your IT service desk has never been greater. However, in order to deliver on ever-increasing expectations, and to maintain a seat at the table, your service desk needs to up its game. But where should you focus your improvement activities? Automation is changing the way we work and live. From self-driving cars to AI-powered virtual assistants, everyone is scrambling for the latest in automated technology. The immense pressure for digitized business operations leaves enterprise organizations searching for process automation that improves accuracy and speed, while transforming the customer experience. In this webinar you will experience three process automation use cases that will free-up staff to work on more productive projects, reduce human error, and provide faster, more efficient responses to incidents and requests. - How organization establish process coherence in a complex supply model. As digital transformation moves from vision to reality, many organizations are still struggling with manual, disconnected processes. Gaps between systems, people, and functional groups stifle the cross-functional innovation needed to produce true transformation. IT teams that are leading the charge in the digital era are adopting solutions that integrate systems, automate enterprise-wide workflows, and offer a collaboration platform that transcends functional silos. They are automating key processes across IT, PMO, HR, Security, and Facilities. Join IT leaders for a discussion on creating a unified service experience, boosting productivity, and making work flow. Mike Johnson is the Primary ITSM Administrator and Developer for Cherwell at the Wendy’s International Corporate Office. Mike attended Ohio Wesleyan University and received a Bachelors Degree in Psychology with a primary focus in survey methodology and research based data collection. He has 6 years of experience with the Wendy’s brand and started out as a level one support technician. His other roles have included Data Analyst and Workforce Management Scheduler. Pulin Bhatt is the Director for Client Services in Office of Information Technology at University of Texas - Dallas. In his current role he oversees the Service Desk, Desktop Support, AV Technologies, Labs, and ITSM. In the past, Pulin has held various roles supporting End User Technology in different industries like Finance, Legal, and Corporate. Pulin holds an undergraduate degree in MIS and an MBA from Texas Tech University. Pulin is passionate about service excellence and bridging the gap between technology and those who use it.